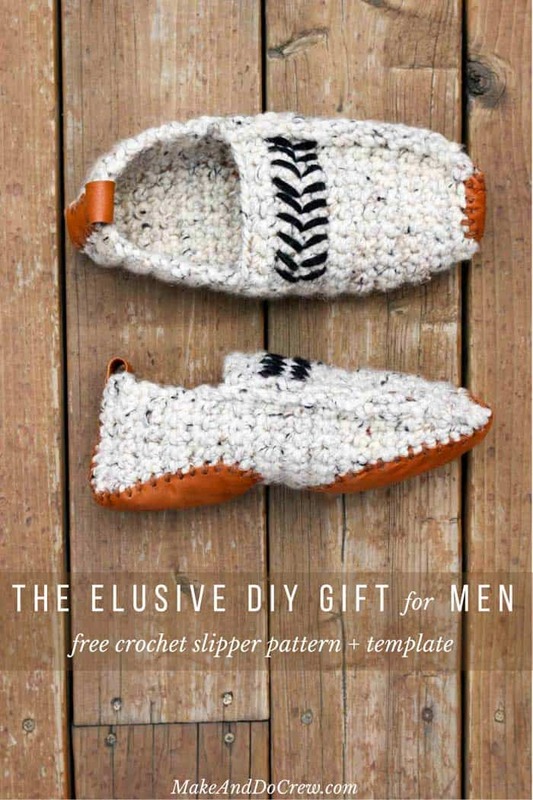 Outfit your dad, husband, brother or boyfriend in a pair of modern men’s crochet slippers with leather soles for the perfect quick DIY gift! The free unisex pattern and video overview is below or purchase the ad-free, printable PDF for $2.75 here. Ladies and Gents are covered! 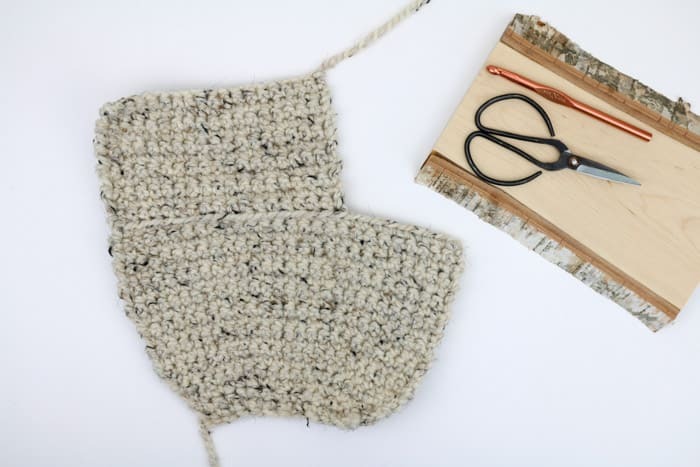 Last week I shared a simple, modern pair of crochet women’s slippers that can make an easy go-to gift for the ladies in your life. When I finished those though, I realized that it’s actually the men in my life that provide the biggest DIY gift-giving challenge. 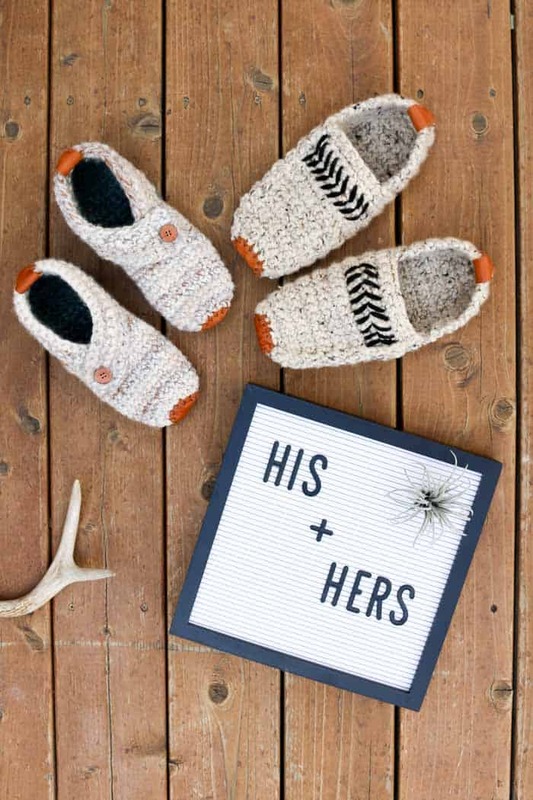 So today, we’ve got e-v-e-r-y-o-n-e covered with these two adult crochet slippers patterns. In fact, today’s men’s crochet slippers pattern actually works well ladies too, so gals, take your pick on whichever style you like best. 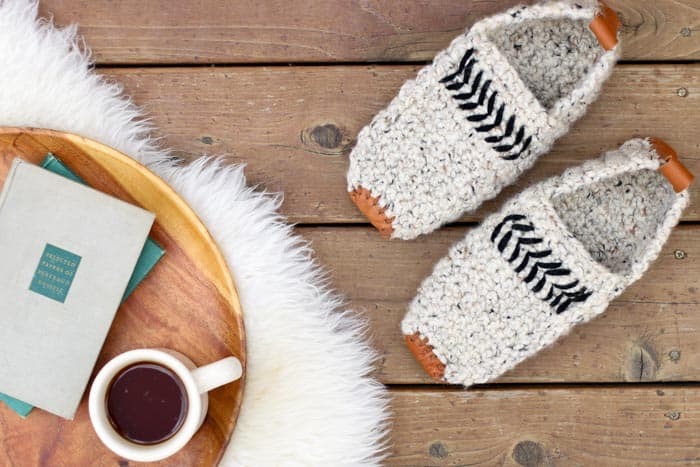 Just like the women’s Sunday Slippers, this men’s crochet slippers patten relies on leather soles for a touch of distinguished fancy-pants sophistication. The same thrifted leather jacket I used for the women’s version once again came through and provided some beautiful carmel-colored leather soles to make these slippers less, well, slippery. If you’d like to create your own soles from upcycled leather, look for a jacket or purse that’s made from fairly thick leather, the more patina, the better. 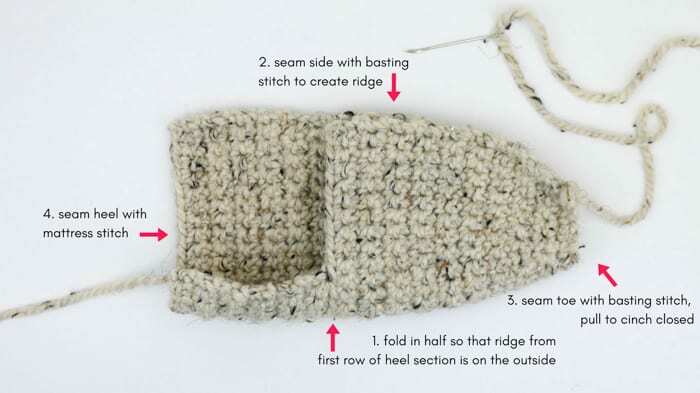 And again, I put together a free printable slipper sole and added it to the subscriber Vault. Just subscribe in the box on the sidebar or at the bottom and you’ll receive an email from me with download instructions. I put together a brief video below that shows exactly how easily this men’s crochet slippers pattern comes together! Scroll down for the complete free pattern. At a loss for what to make the man in your life? 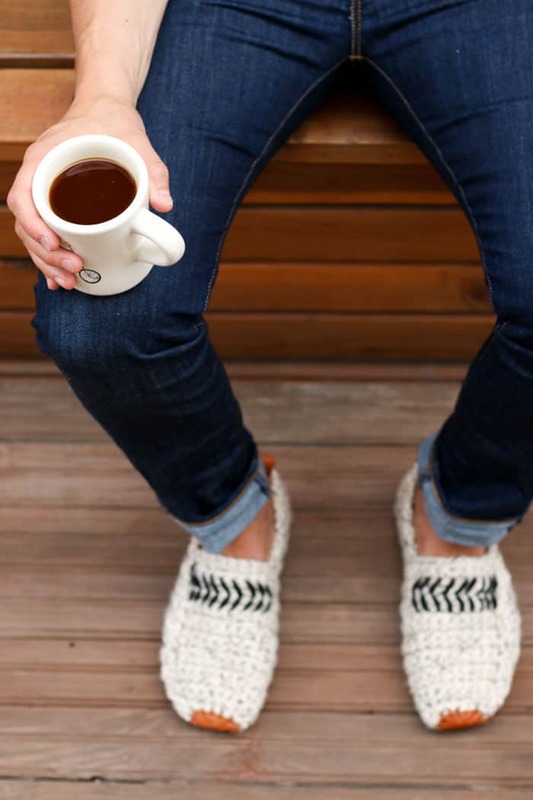 These modern men’s crochet slippers will give you a go-to gift for dads, sons, brothers and boyfriends from now on. In fact, the pattern includes women’s sizes as well, so you can outfit everyone you know! Worked flat with very simple stitches and techniques, these slippers can be crocheted in an evening and worn the next day. Add embroidery and optional leather soles for a touch of sophistication and you’ll have a gift that feels functional, personalized and totally cozy! • Right and left slippers are worked identically until the heel section. 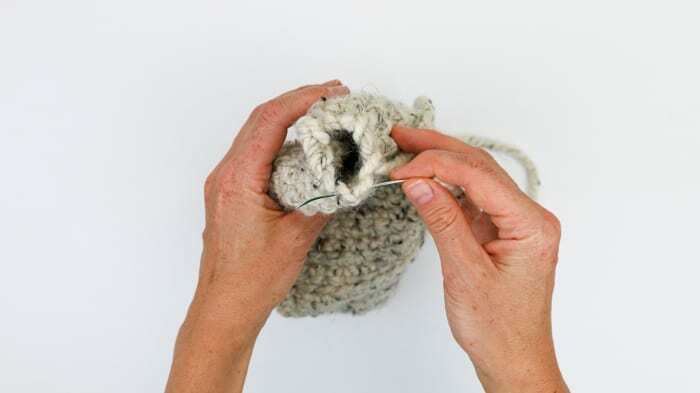 • Stitches are intended to be worked tightly. If in doubt, please check your gauge. • If you’re creating slippers for someone who is not nearby to try them on, or you’d like to adjust the pattern to create a different size, this chart of shoe sizes measured in inches from Shoes.com could be helpful. Keep in mind, they’ll stretch a bit when worn. • See the women’s version of this free crochet slippers pattern here. Foundation Row: Using MC, make a slip knot and leave a 20” tail. Ch 13. • This section is worked back and forth in rows. Row 1 is worked into the last round of toe section. Rep Row 2 4 (6, 6, 7) times. Fasten off leaving a 20” tail. • You may find it helpful to read through the entire seaming section and reference Photo E before beginning. Watching the brief video overview of this project could also help clarify seams if you’re a visual learner. • Adding embroidery is a fun way to spiff up your slippers. Feel free to experiment with different designs! • The embroidery stitches are worked into the holes between the single crochet stitches. • Reference photo above for additional visual details. Using a tapestry needle and a doubled over strand of worsted weight yarn, work a series of nine arrows as pictured above. As shown, each single side of the arrows spans the height of two crochet rows and one crochet stitch. Note: the photo shows the option of one or two rows of single crochet above the top of the arrows. Ultimately, I chose to leave two rows of space above the arrows. These two rows will look slightly different on each slipper because of one slipper is technically using the back of the crochet fabric and one is using the front. This is not important to understand, just know that nothing is wrong! • The leather soles are optional, but will help the slippers last longer and slip less on wood floors. Use a leather punch or a nail and hammer to make holes around each leather piece about 3/8” apart. Do not punch holes in the top section of leather than will be at the top of the slipper ankle. With a tapestry needle and a doubled over piece of yarn that matches your leather, sew soles to slipper bottoms using a whip stitch. 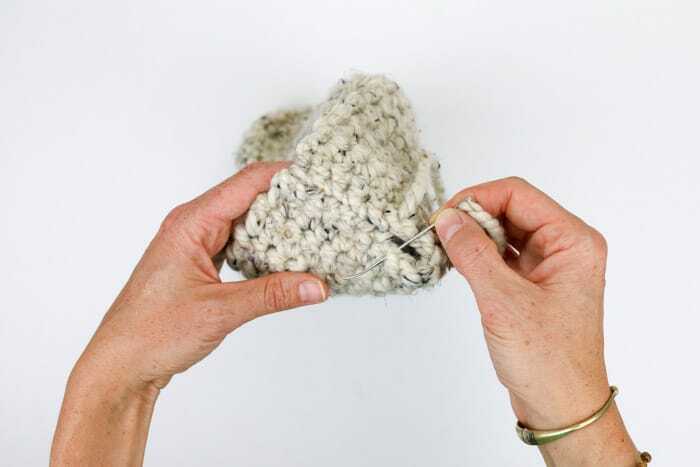 I’ve found that even the strongest yarn can wear out pretty quickly when used to secure slipper soles, so you can choose to use a doubled over piece of monofilament (fishing line) instead or in addition. Light the fire, pour a scotch and bestow these cozy slips on your favorite gentleman (or gentlelady 🙂 )! GET THE PRINTABLE LEATHER SOLE TEMPLATE! 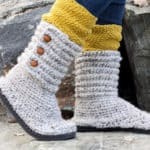 Get the free slipper sole template plus other free patterns that will knock your little handmade socks off. Jess, you are a very talented woman. Your designs are classy. So many of us are visual learners and your videos are so very appreciared. Personally, I enjoy the fact that you’ve brought something new to the crochet world…(how many afghans can one use or give away?) Love the fact that these are both portable take far less time to complete. Do you ever work with thread crochet? Love it as well but how many people use doilies any more….there must be something else out there. . Keep up the great work….don’t change.. Am sure others appreciate the fact that you consider cost with your designs as in using inexpensive flip flops and thrift store leather items for your designs. Thank you! Totally agree! (Well said Yvonne) Thanks for all you do Jess! It’s truly my pleasure, Marilyn. Thank you for being here! Oh, Yvonne. Thank you so much for your kind words. I feel like you really understand what I’m about! I want everyone to be able to make something they’re proud of and have it not cost a million dollars to do it. Thank YOU for being here! Great point about the crochet thread! I actually just shared a tutorial on patching jeans with crochet and I bet it would be beautiful in thread. I’m wondering what’s the point with the single crochet through the back loop only on the first row of the heel of section? 🙂 just did that one now. Just a little visual detail. 🙂 If you don’t care for it, feel free to do normal sc. Done with my right foot sock! Prob will add a border because the heel doesn’t go as high up as it should so they fall off easily. I did the heel as 17 chains or what u call it (I’m Swedish) so to make it go higher I’ll just do like 19 chains? Definitely on my to do list for this winter! Both slippers (women’s and men’s) are so adorable and sophisticated! I know my husband will love them! Thank you for another great pattern. I love all your patterns thank you so much for sharing with us. You are so talented. Thanks again. Thank you so much for this free pattern! I was wondering if you could provide any more details on seaming the sides–the slippers I made look slightly different at the toe than the ones you made (much more rounded, not as square toed), and the man who tried them on said that they were a bit big in the toe area (which is what I was expecting after trying them on myself). I’m wondering if I should have sewn the part of the side closer to the toe tighter than I did? Or do you have any other tips on how to make the toe region fit a bit snugger without unraveling and starting over with less increases? Thank you again! Good question. I’m wondering if just including a little more fabric in your “seam allowance” might tighten things up, meaning that you do just seam the slippers a little closer to the toe. This way, there will be a bit more of an “edge” along the outside of the slipper and most likely, a bit more of a square toe too. Is there a tip for how to add the punches holes in an even way or do I just use a ruler? You’re welcome! I just eyeballed the holes, but a ruler would also work great! Hi ma’am love love love your work !! If i need to fit a 12W for a man do i need to increase my stitches anywhere? Where do you find a 9MM crochet hook? I have looked at the craft store and all I can find is 8mm or 10mm. Which size should I use? Is there a video for the men’s slippers that don’t go so fast? 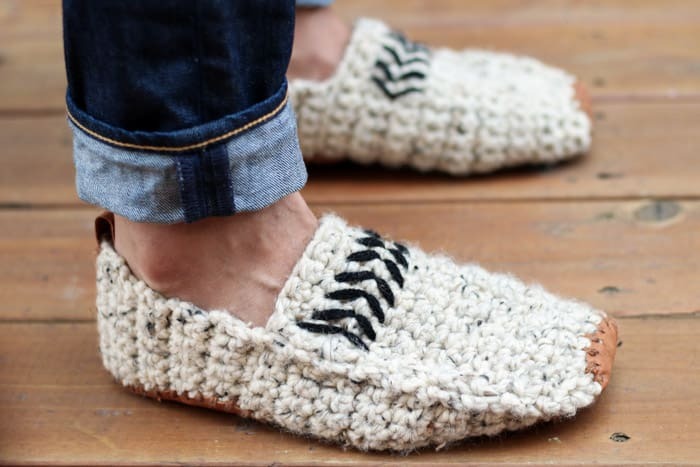 It is for the Modern Men’s crochet slippers. Thank you. I have a question in regards to yarn. 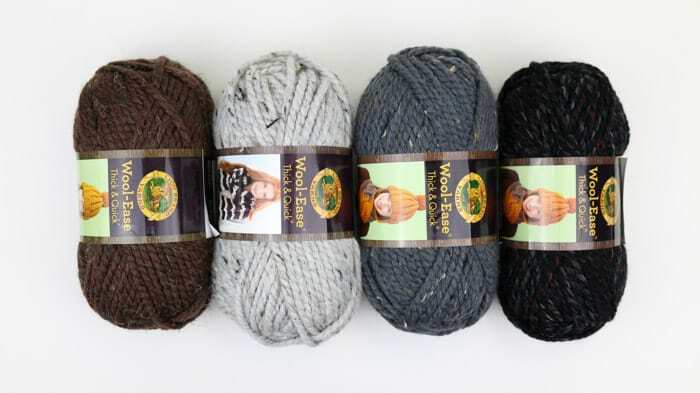 I have trouble finding Lion Brand Wool Ease Thick and Quick. Is there a substitute yarn I can use. 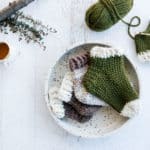 I realize they are a sponsor but I cant figure out what would be an equivalent yarn to use and there are so many items I want to make on your website. Hello jess, i really liked your post and enjoyed reading it too. I like your slippers as well. 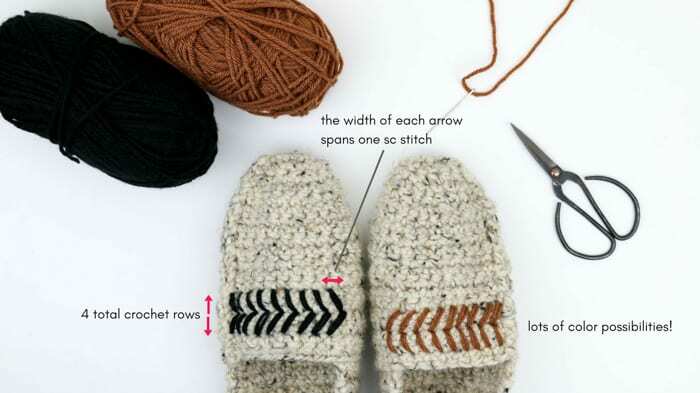 These slippers are adorable and I am making them for a lot of family members for the holidays. I do have one question regarding adding the leather soles: How do you keep them from moving when you are sewing them on? I have a lot of issues getting the soles in the same place on the shoes and it tends to bunch. Any tips? What great gifts! I think your family will love them. I pinned mine on using safety pins through the leather holes and it worked quite well. Then just check frequently to make sure your sole hasn’t moved during sewing. 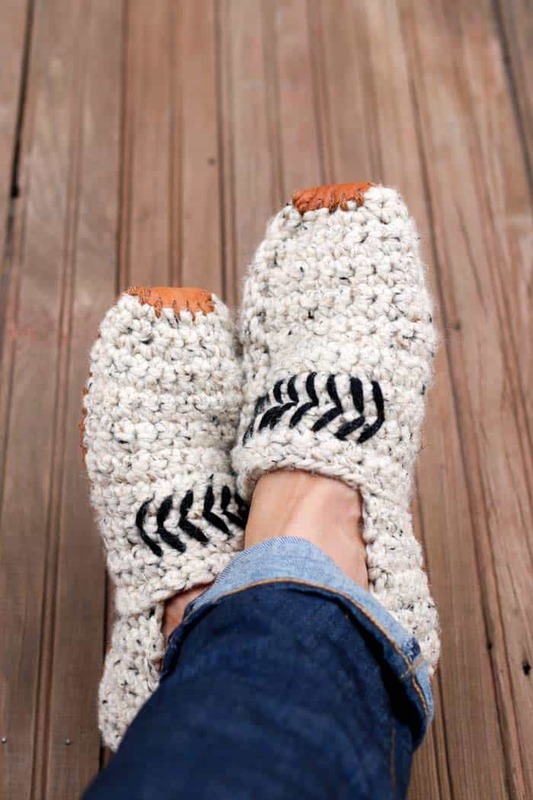 Hi I love these slippers and would love to make these as Christmas gifts I’m new to crocheting and was wondering what the number in parenthesis means in the instructions. Thanks in advance. 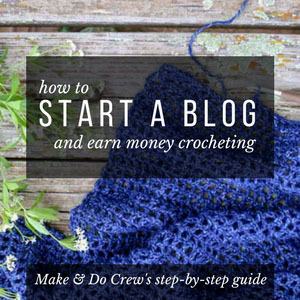 Welcome to the wonderful world of crochet! The () number is for each different size. So the first number listed is usually for the small size and then each subsequent number is for the larger sizes. Also, it it’s () at the end of the row, it means how many total stitches you should have at the end of a row. I see that the smallest size here is M 6/7 and W7/8 but was shooting for W 5/6 ? I was wondering if you had a calculation for making a smaller size that I could do to figure out how to change the pattern? Like 2 or 3 less rows on certain parts? P.s. This is a lovely pattern, I made these for family members this past Christmas and I used 100%, they loved it! This is a lovely pattern, I made it for christmas gifts <3 I was wondering about a smaller size. I see that the current smallest size is the mens 6/7 which is equivalent to the women's 7/8. Is there some kind of calculation I could do to figure out how to make a women's size 5/6 ? I was thinking it was probably 1-3 less rows in parts of the pattern but wan't sure. Any help would be appreciated! Thank you! Hy your pattern is very nice. I would like to have the pattern. Hi Julia, you can purchase the ad-free printable PDF version if you would like. Or, you can use the free pattern that is at the bottom of the blog post. Thanks!